What bike sharing might look like on the streets of Chicago. Photo of Capital BikeShare, in Washington, D.C., by M.V. Jantzen. Updated 11:11 AM: I should have mentioned originally that I believe this is a good idea for Chicago, and the RFP presents a solid plan on how the City expects it to be implemented and operated. 22:46: Added more information about potential bidders, Alta Bicycle Share and B-Cycle. I just finished reading the request for proposals (RFP) for Chicago’s first (er, second) bike sharing program. For the uninitiated, most bike sharing programs allow members unlimited free trips per day up to 30 minutes with a low fee for each 30 minute period after that. Locks are not provided so users are expected to secure the bikes by docking them at stations rather than locking them to bike racks or sign poles. Chicago Department of Transportation Commissioner Gabe Klein and his managing deputy commissioner Scott Kubly together launched a 1,100 bikes and 100+ stations bike sharing system in September 2010. It had its one year birthday on Tuesday, September 20, 2011. Now the pair have come to Chicago to do it again. In the RFP, the City describes its vision for the bike sharing system. It also says that the city will purchase and own the bike sharing system – I didn’t expect this because I thought the City didn’t want to spend its money on the system or have any liability (from the RFP: “The City seeks to minimize City funds provided for the operation of the bicycle sharing system”). 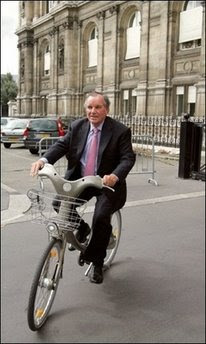 This was the reason the City failed, although it tried, to implement bike sharing after former Mayor Daley visited Paris and rode a Vélib’ bicycle. Quoted from the RFP, on page 1, or 26 in the PDF. Enhance Chicago’s existing public transportation system by providing bicycles to complete the first and/or last leg of a trip (e.g., from a train station to the workplace). Expand the health and wellness benefits of bicycle transportation beyond traditional enthusiast groups to everyone living or working in the City. Reduce dependency on automobiles, particularly for short trips, reducing traffic congestion, vehicle emissions, and the demand for parking. The system will enable “walk up” rentals for people who don’t have memberships, but not all stations must allow for this. The stations must be solar powered and execute transactions wirelessly so that no utilities have to be extended or added. Stations will primarily be located on streets and sidewalks. Stations will be located on other public property, including transit stations, parks, and educational institutions. Bikes will have at least three speeds, front and back lights that turn on automatically, puncture-resistant tires, and be theft and tamper resistant (through uncommon parts that require hard-to-get tools to remove). Chain guard and fenders are not required, but “most desired”. The RFP does not mandate that the system be operated during the winter. Minneapolis’s Nice Ride and Montreal have systems that are removed during the winter. The city marked as “desired” (the lowest ranking) a feature for a website that allows users to track miles traveled, calories burned, and CO2 emissions not emitted. This is a very cool idea. 1. Chicago’s bike sharing program should integrate with the upcoming universal fare card system the Regional Transportation Authority must create, and which the Chicago Transit Authority (CTA) has been investigating for several years. For transit users to sign up for bike sharing, it should be as simple as clicking a checkbox on the universal fare card website saying they agree to the terms and conditions. Their card could be used to pay for a trip on the ‘L’ and then also check out a bike at the last stop so they can ride to their final destination. Essentially, bike sharing is an extension of the existing train and bus transit network. 2. Pursuant to Mayor Emanuel’s open data initiatives, data about the bike sharing program should be released and updated nightly. This data should include the number of stations in operation, the number of bikes in use, the number of bikes not in use, the number of bikes out of service, the location of stations, as well as trip data like number of trips per day, duration of trips, and distance of trips. With this data, interested citizens can create applications and website that track the performance of the system (see Where’s My Villo in Brussels, Belgium, and Oliver O’Brien’s’ interactive bike sharing availability map) or help subscribers locate open stations with a smartphone app. 3. The bike sharing system will only take credit cards (and debit cards with Visa or MasterCard logos). As Scott Kubly discussed at September’s MBAC, this limits the number of potential subscribers. The City and the operator must work with banks to open checking accounts for people who may have difficulty obtaining checking accounts (because of poor credit that requires undesirable fees), or don’t have the appropriate documentation to open an account – this group of people is sometimes called “unbanked”. 4. The City is reserving for itself the responsibility of defining the “implementation zone” (page 28 in the PDF), and the locations and densities of stations, but with input from the RFP respondents. The City must also consult Chicagoans, CTA, Metra, and interested organizations. NYC set up a website allow New Yorkers to select on a map locations where they would like to see bike sharing stations; others can vote on already existing locations. In 24 hours, people had already submitted 3,200 station locations and made 13,000 +/- votes. Bike sharing is one way to make cycling more accessible to people of all ages and abilities. Think 8 to 80. Photo of the Bicing bike sharing system in Barcelona, Spain, by Brandon Souba. The RFP says that Chicago will have the largest bicycle sharing system in the United States, to happen in two phases by the end of 2014: 3,000 bikes at 300 stations, and, subject to the availability of funds, 2,000 bicycles at 200 stations (total of 5,000 bikes at 500 stations). Yet New York City announced last Wednesday, September 14, that it plans to have 10,000 bikes at 600 stations. The contract term is for 5 years, and the City has the option to renew the contract for two more 5-year periods. The City will hold a pre-proposal conference at the Department of Procurement Services, 121 N. LaSalle St, in room 403B at City Hall, at 2 PM on September 28, 2011. The winning RFP respondent’s bike sharing system may be nothing like B-Cycle. B-Cycle is certainly entitled to submit a proposal for this RFP, but six companies bid for the bike sharing system in New York City, and the same six could submit proposals here. The winner is Alta Bicycle Share, which operates the Washington, D.C., Capital Bikeshare program. B-Cycle was also on the two-company shortlist for NYC. I don’t know who the other four companies were. I like the idea of integrating with a universal fare card, particularly considering that the City is framing this program as another major transit option on equal footing with CTA. CTA wants to get out of the business of managing and collecting fares. I’m still unclear of the specifics of how CTA, Metra, and Pace would handle things like multi-ride passes and associated discounts with an open fare system. However this open fare system works, it would be nice if integration with bike sharing is as smooth as possible. Hopefully the terminals will at least accept NFC payments. I also noticed that the RFP lists acceptance of chip-and-pin cards as “most desired.” That would be important for making it easy for international visitors to try the system. I love the idea of accepting chip-and-pin cards. I read that Vélib’ in Paris is making it so that stations can accept RFID-enabled bank cards. This will definitely make the system more available to American visitors. I didn’t want to get into the specifics of the “universal fare card”. I believe it won’t be an actual card but a system and network that accepts cards from any bank or NFC-enabled cellphones, like you described. The integration is key. Think of how I-GO cars can be integrated with the Chicago Card Plus. There’re other ways transit payments can be made more efficient, including adding RFID chips to university student IDs and synchronizing them with the CTA fare system, eliminating the need for costly magnetic fare cards that must be printed and distributed every semester at 20+ colleges to over 100,000 students.